I apologize if this has been thoroughly discussed on this forum,but I can't seem to find much info on the subject. I am in need of an iwb holster for my elite. All i can find are holsters for the tp9sa and sfx. Are they interchangeable? What do you guys recommend? I second the SMC holsters. I just received my second SFX Comp 2 and the quality is second to none! As mentioned, reach out to them and see what they can do for the Elite Series. 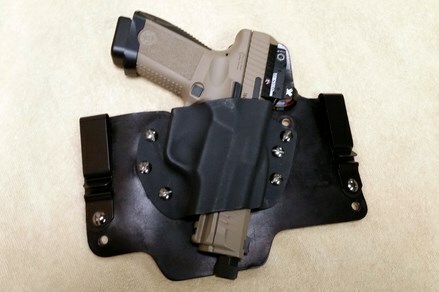 Not to go against the current wisdom but you can also get the no print wonder from Clinger Holsters, It's a versatile system that you can change out the hardware and turn it into a OWB holster too if you wish. I find it conceals very well IWB. 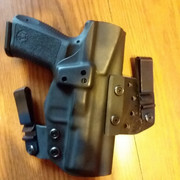 Crossbreed Holsters also makes some good ones to fit the Elite. Plenty of choices if you just look around some. The smaller companies seem to move faster on their feet than the huge companies like Galco. I'll second Clinger I have bought a couple of the no print wonders. I haven't paid too much attention to Clinger holsters. I'll have to look at them more closely. Heres 2 of mine, the cheapest basic iwb and the more expensive ($30 and $50 is what i paid) adjustable one. 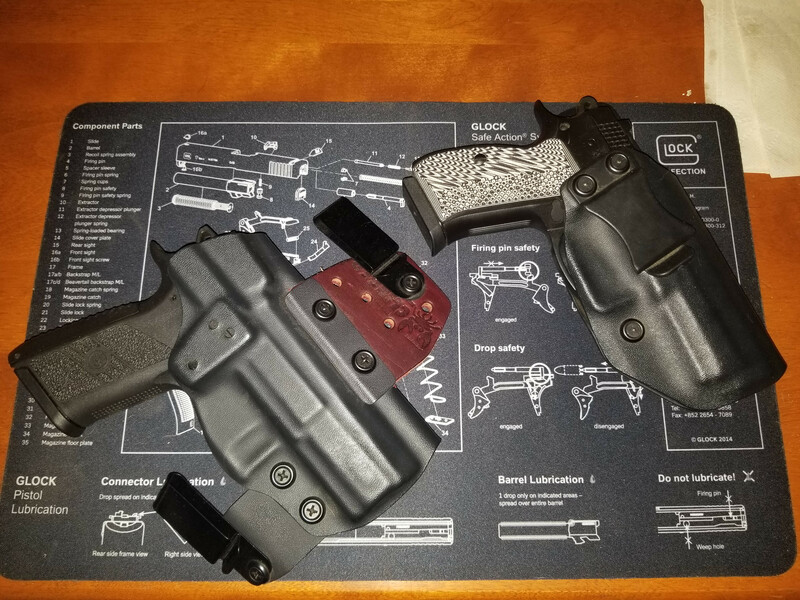 They're both pretty good holsters the no print is worth the little bit extra money for adjustability and is more comfortable. Nice. How does the P07 feel carrying it IWB? I'm looking at getting the Clinger Wonder for my Walther P99c as I'm looking at their site, but I may get it instead for my P07. It carries pretty good in the Clinger though I think I'm going to raise the clips up a notch so it sits a little lower, I carry it at 4 oclock and its comfortable there sitting or driving. I got this for my Elite and it fits great. 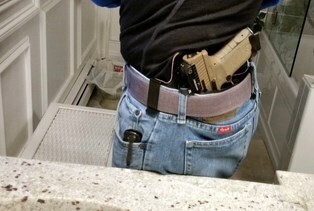 I am not a carry guy, so can’t speak for carry comfort of it. Bought it for if/when I need it. But, feels comfortable when walking around the house. Edit: tried to upload a pic of my Elite in a Clinger- but I can not seem to make it work. I have the Stingray. Never heard of the Clinger brand. The V3 No Print Wonder Holster looks very interesting! I like the concept. 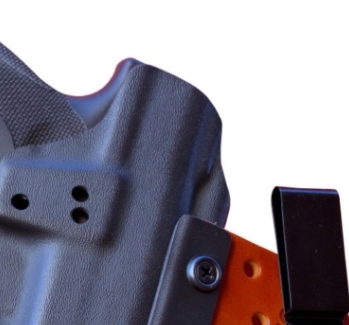 The lower clip uses the same approach as an appendix carry holster to pull it in towards the body. I'll have to call them and see if they can do one for the Combat and what options are available. I definitely need an optics cut. I'm currently using a White Hat MaxTuck that I had a kydex for a M11-A1, and it was just about a perfect fit for the Combat. I did have to cut and shape the kydex for the optic. 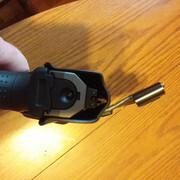 The MaxTuck already has the forward cant established and has dual clips to adjust it further. I tried one of their holsters with the single clip and didn't like it. One thing that I forgot to mention about Clinger. I ordered my no print wonder with all the extra hardware on Wed. night after it had closed. It says on the website to give them 3 days to make it. They shipped it the next morning and I received it via US mail on Sat. Can't beat that sort of customer service. Agreed! I have two and they are awesome. I also reached out to Clinger with an email to see it they can do a V3 No Print for the Combat with an optics cut. I'm sorry but we don't currently support that setup. It has been added to our request list though. We might add support for that canik later this year. Please let us know if we can assist you further! ...I guess one option would be to cut the kydex myself for the optic and trim for the threaded barrel. I think the end of the barrel would still be within the overall length of the kydex. I'll have to take a close look at my Elite and Combat and see if there is anything else that would need to be addressed. Now that I looked at this a little bit closer...I think the upper leather mount is definitely in the way of where the optic cut would be. Definitely would be for me. I'm considering a Wonder for my CZP07, which that too would be a little big for me to IWB. But I'm getting bored carrying my Walther P99c and want to mix it up. 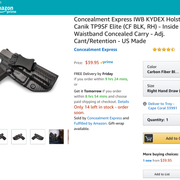 I thought about my Elite, but the slide is longer than my P07 and Walther P99c, so I don't think it would be very comfortable for me. 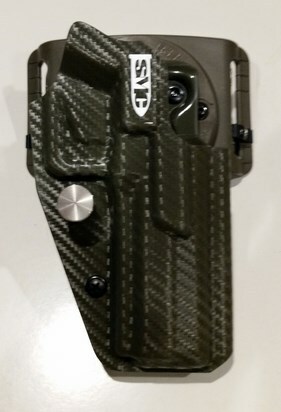 Looking at the one for my p07 it looks doable to cut the kydex, screw looks like its just barely not in the way, only have the stingray for my elite though so cant tell for sure. Don't have a clinger for my Glock or S&W which are only ones currently wearing an RMR.